A Shepherd's Heart: Don't Just Say That You'll Pray...Actually Do It! Don't Just Say That You'll Pray...Actually Do It! When you say you will pray for someone, do you say it as just a passing phrase or do you actually intend to pray for them? I think we're all guilty sometimes of saying we'll "pray", (kind of like "how are you doing" but not really wanting the answer sometimes...just a passing phrase) and not following through with prayer and...we need to change this! The fact is that prayer is a fundamental tool God has gifted us with. 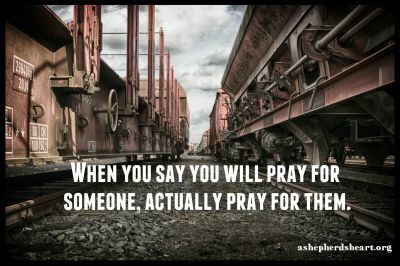 "When you say you will pray for someone, actually pray for them!" We're to be people of prayer and commit to praying for one another. So, let me encourage and challenge you to be a man or woman of your word and The Word...and make every effort to follow through and pray when you say you will do so. I pray that God will help us take prayer all the more seriously.